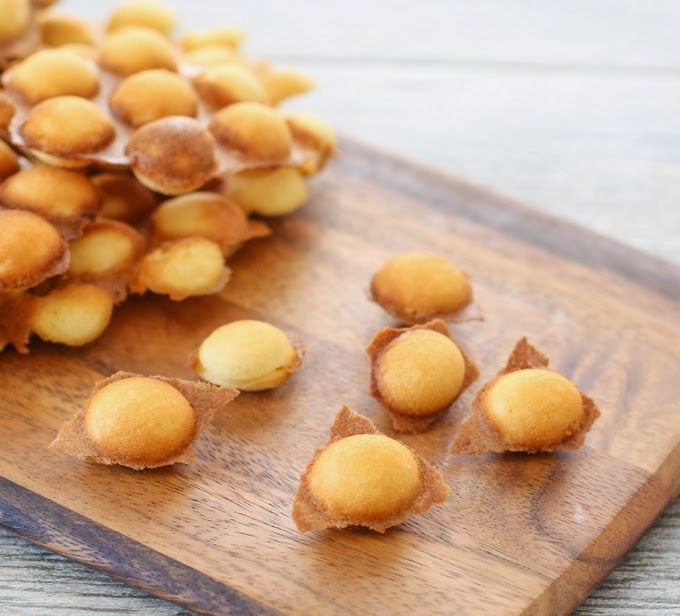 Hong Kong Egg Waffles (sometimes referred to as egg puffs, eggettes or bubble waffles) is a popular street dish. The sweet, waffle-like batter is cooked in a special mold. 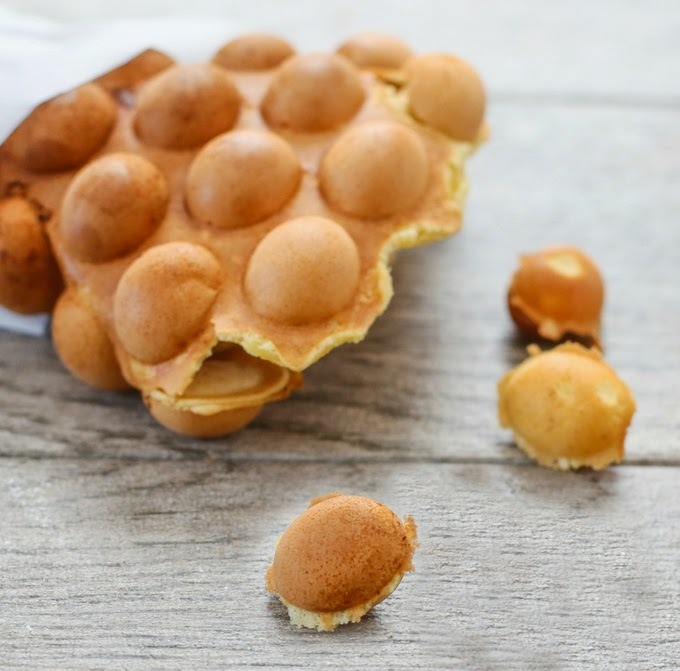 The end result is a waffle with crisp edges and soft oval “eggs” or “bubbles” which can be easily broken off for snacking. I made these successfully a few years ago, but it’s definitely been a while. We had some friends visiting this weekend and they expressed interest in wanting to try my egg waffles. I haven’t made the snack since moving and I hadn’t figured out the right setting with me new stove, so the ones I made for them weren’t as pretty as I had hoped. Unsatisfied with my Saturday results, I spent most of Sunday researching recipes and playing around with different cooking times. After about a dozen waffles (Mr. K was having way too much fun eating all the rejects), I finally had some pretty ones to show off. I have yet to be able to get an entire one uniform in color. I think this is because the pan does cook on the stove top and so the heat distribution is not completely even. The commercial ones seem to have more success because they are built like traditional waffle irons that you plug in and cook and it heats evenly across the pan. These are still super tasty and fun though! * Let the batter sit for an hour before cooking. * Evaporated milk is a key ingredient. I tried substituting it with regular milk and the consistency of the batter isn’t the same. It made the batter thinner and stick to the pan. * Custard powder is another key ingredient that effects the softness of the waffles. I use Bird’s custard powder which can be found at Fresh & Easy or Amazon. I’ve also had successful results substituting with vanilla pudding powder mix, but I like using custard powder when I can. * Tapioca starch is also a key ingredient. 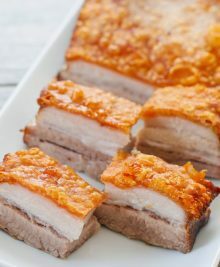 I’ve seen some recipes that use cornstarch which often is a substitute, but I felt like the results were better with tapioca starch. You can find it in Chinese grocery stores, near the glutinous rice flour, potato flour, etc. * The first waffle will be a throwaway one. Similar to your first pancake, the first one will be pale, might not come out in one piece, etc. * Make sure you preheat both sides of the pan first before you start and brush oil on both sides. When your pancake is ready, slowly peel it out, starting from one end and with some help, you should be able to get it out in one piece. It usually rolls up a little as it start to come out of the mold and it’s often served rolled up since it is a street dish. * It may take a few tries before you find the ideal cooking temperature and time. Mine needed about 4 minutes on each side, but flipping at 2-minute intervals. 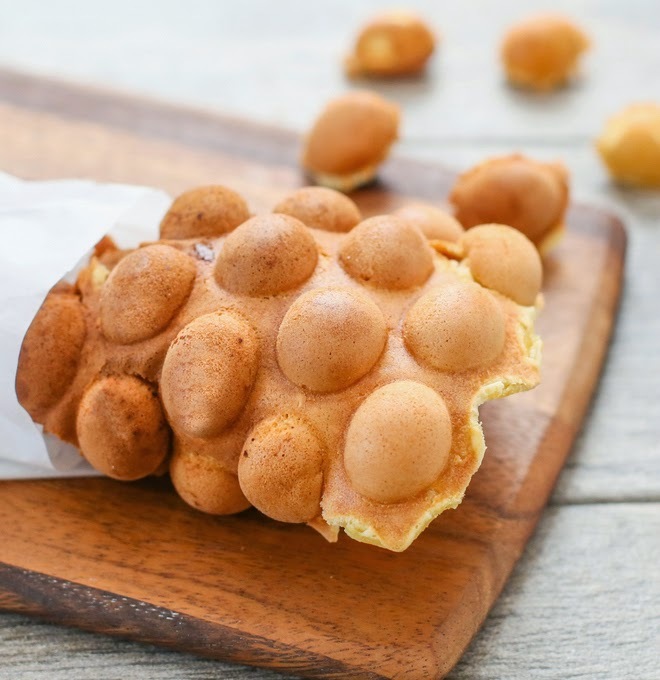 Hong Kong Egg Waffles (sometimes referred to as egg puffs, eggettes or bubble waffles) is a popular street dish. The sweet, waffle-like batter is cooked in a special mold. The end result is a waffle with crisp edges and soft oval "eggs" or "bubbles" which can be easily broken off for snacking. The batter is easy to make but plan to let it rest for an hour before you make the waffles. In a large bowl, add all ingredients and mix with a whisk until only very small lumps remain. Set batter in the fridge for one hour. Read instructions on whether your pan can be placed directly onto stove or if it needs a wire rack and do accordingly. Pre-heat each half of the waffle pans on medium-high heat until hot (about 1-2 minutes). Lightly brush each pan with vegetable oil (don't use spray). Turn heat to medium (I set mine at dial at 4). Remove the side of the pan the finished egg waffle is clinging to, and hold it above a plate with the waffle upside down. Using a chopstick or spoon, gently loosen it from the pan, starting on the top edge, using gravity to help it release. It will start to curl as it falls off and you should be able to get it out in one piece (except for the first waffle). Repeat with the remaining batter (re-greasing pans first) and then serve immediately. I finally bought myself an egg waffle pan last year and agree that these are finicky to make! I bought one for my parents as well, and they have had a blast trying to recreate our favorite street food from the NYC Chinatown. Thanks for the tips – I’ll have to try your recipe next time (we just used the recipe that came with the pan). I really love these! But yes it is frustrating getting it to look as good as the ones you get on the street. I really want one of the electric ones but I can’t find any home-use ones. I bought the same tool and haven’t used it yet. Gonna try your recipe first before other random internet ones. Also thanks for the heads up on where to find custard powder. Been having a hard time finding those. yes, custard powder is a pain to find! I hope you enjoy the egg waffles! Your egg waffles look just like the ones at Eggettes. This is such a fun snack to eat. I found an egg waffle iron on amazon! It looks good for home use too! thank you! Over the weekend, someone told me a similar one at Bed Bath and Beyond. I wonder how it is! You can find the Custard powder an any World Market. You can also try this recipe with a Mini Cake Pop Maker which you can get for as low as $11 on Amazon. I love these! I just made them. I was wondering if I can freeze the batter for next use? 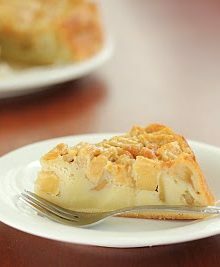 I was thinking of making a big batch and just freezing it, for easy preparation :). Please let me know. Sorry I haven’t tried freezing the batter so I don’t know the answer. if you try, please let me know! Hi, thank you for the instructions, my friends love this, especially with some ice cream and fruit wrapped up by the waffles. BuT I can’t find the little white bags that vendors sell it in. I see a picture you have with that bag. Where do you get those??? Mine is not a white bag, just some paper cones I made myself. You can usually find them on Amazon and other baking supply stores. I did get the electric one and I use it all the time! 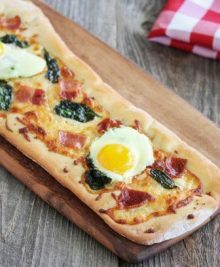 It doesn’t quite have exactly the same texture as the cast iron, but it’s pretty darn close and it’s so much easier to use since you don’t have to be constantly standing over the stove and flipping. I tried this recipe on my electric maker. First time waffles turned out great: crispy from the outside, and soft on the inside. But whenever I tried to make them again, waffles were soft from the outside as well, not crispy at all. Do You know what’s the catch? Delicious recipe. Just slightly sweet. It’s perfect! I made the bubbles using a cake pop maker because I couldn’t find the bubble waffle pan locally (and I didn’t want to spend $100 on a pan for my first time making them–might invest in one now though). Filled the wells about 75% and put on oven mitts and flipped the whole cake pop maker. They turned out great and I got the mother in law’s approval (WOW). Thanks for the awesome recipe! Lived in Hong Kong 20 years. Loved it. Also tried to find recipe for chow down food smelly tofu. Never able to find.Can you help me with this ? Have you tried cooking it longer to get it to crisp up? Also make sure to refrigerate the batter. it really does make a difference! Hi! :) Thank you for sharing your tips. Works really swell! :) but i do have a question… does your loose crispiness also after awhile (awhile as in say 5 mins after)? The waffles are definitely best eaten right away! they will lose crispness as they cool down. Tried out your recipe and it tastes quite similar to the ones I’ve had before except I realized that I left out the vanilla extract so I’ll have to try again. My mom also tried it out and thinks maybe 3 eggs might be better but we are going to experiment some more! I also have the the CucinaPro Bubble Waffle maker and found that the outside exterior is a bit of a hit/miss to make it crunchy/soft but I think playing around with the cooking time might be the key for an electric one.. I tried again with 3 eggs and 5 mins for cook time but it turned out too soft overall. I did another test with your exact recipe but changed the cooking method by pouring the batter with a pitcher which makes it easier to distribute and flipped the electric waffle maker over immediately then flip it back 2.5 min later. I now have the correct texture! Crunchy on the outside and browned nicely while its soft on the inside although there is some refinement needed with my maker still perhaps I need to re-apply the oil every 2nd waffle. This is one of my favorite treats! And the electric waffle maker is much easier to use!